Let Boingo Wi-Finder do all the work. Wi-Finder actively finds and notifies you when you are at a Boingo Wi-Finder accessible Wi-Fi hotspot. You can set the Wi-Finder App to automatically connect to commercial free hotspots. 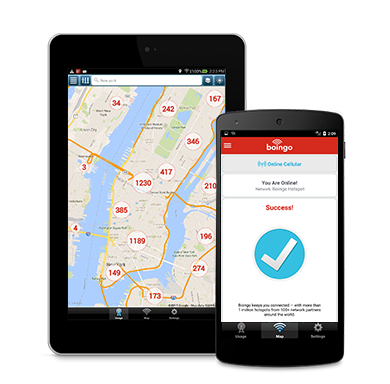 Boingo Wi-Finder will seek out the best available Wi-Fi signal and get you connected. When free hotspots are not available, don’t fret. 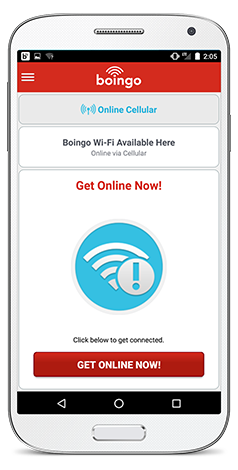 With a Boingo subscription account and Boingo Wi-Finder you can connect at more than 1,000,000 Boingo hotspots around the world, including airports, hotels, coffee shops, stadiums, convention centers and more. Boingo will alert you when you’re in a Boingo hotspot and get you connected in one tap. Looking for hotspots in Paris, France? Or Paris, Texas, maybe? Let Boingo Wi-Finder go to work. Find local hotspots or search for hotspots worldwide. Get results on a map or list view. Search and filter hotspots according to hotspot quality. Green pins indicate certified hotspots (highest quality), yellow pins indicate trusted hotspots (tested free locations), and red pins indicate unverified hotspots (user-submitted free locations). We recommend connecting to certified hotspots when available – these locations consistently provide great Wi-Fi experiences.